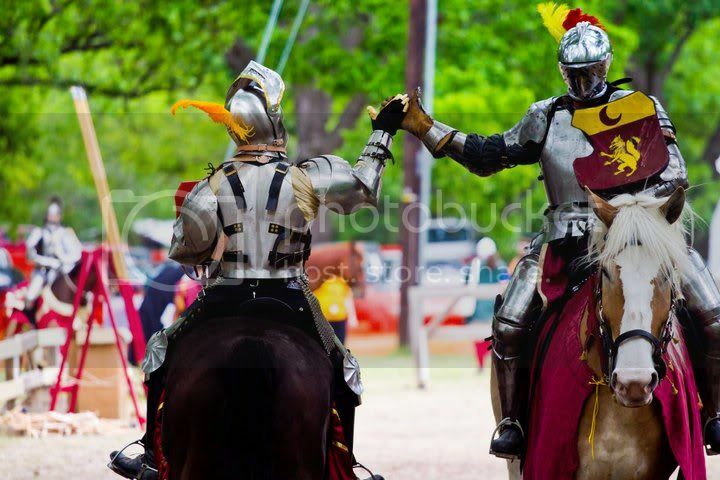 The Jousting Life: Is Chivalry Still Important in the Sport of Jousting? Is Chivalry Still Important in the Sport of Jousting? Chivalry Today is an educational program that, among other things, creates a monthly audio interview show that explores the history, literature and philosophy of the code of chivalry from the middle ages to the twenty-first century. In this month's podcast, host Scott Farrell interviews Steve Hemphill and Scott Wilson. Steve Hemphill is the creator of "Lysts on the Lake", the largest competitive jousting tournament in the world according to the International Jousting League. Scott Wilson is the owner and armorer of Darkwood Armory. 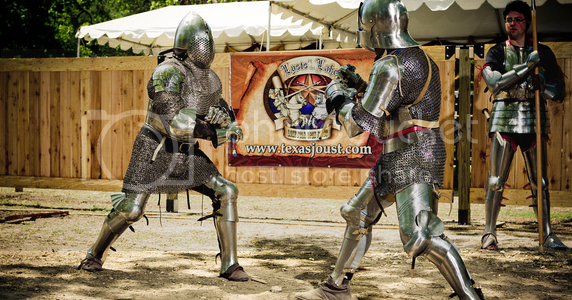 Steve and Scott worked together to create the "Chivalric Martial Arts International" symposium (which leads up to "Lysts on the Lake"), where anyone can learn the basics of, or improve their skills in both foot and mounted combat, including jousting. "Recently the martial arts of medieval Europe have been undergoing nothing short of a Renaissance – moving away from the theatrical pomp and play-acting of scripted jousting shows, and staged sword-fight displays, and toward the more serious study and practice of real, authentic combat on horseback and foot, with lances, swords, and other realistic weapons. But for someone of “knightly spirit” in the 21st century, getting a solid grounding in all of these martial arts is difficult. After all, few of us have a castle courtyard where we can go for private lessons with our masters of horse and sword. But, on May 8th through the 13th, if you’re in the vicinity of Austin, Texas, you can have the next best thing – because that’s when both of these styles of medieval chivalric sports are going to come together in Taylor, Texas at the East Williamson County Event Center, and the Taylor Rodeo Association Arena as spectators, students, and competitors come for the Chivalric Martial Arts International convention, and the Lysts On The Lake jousting tournament. Scott[the host] is joined by Steve Hemphill and Scott Wilson, organizers of the event, to discuss how the ideals of chivalry are viewed by the participants in these events." To read the Chivalry Today introduction in its entirety and listen to the podcast interview, follow this link to Podcast 60: Chivalry Makes the Lyst. During the interview with Steve Hemphill, Scott Farrell asks about the "Lysts on the Lake" Award of Honour, and if the competitors at "Lysts on the Lake 2011" did actually exhibit the virtues of chivalry during the tournament. Steve suggests that his wife, Dawn, who was the Lady of Honour in 2011 and will be again this year, would be the better person to ask about how the winner of the Award of Honour is chosen. However, he does believe that the lack of trash-talking, the mutual assistance among the competitors and the general feeling of camaraderie throughout the event may have contributed to its astonishing popularity among those who participated last year and those who plan to participate this year. Scott Wilson, while talking about competing in the Historical European Martial Arts (HEMA) that will be taught during the CMAI symposium, emphasized that although competitors are doing their best to win the match, they do not have a "win at all costs" attitude. Because of the danger inherent in the sport, competitors must exercise a certain amount of care for their opponents while doing their best to defeat them. According to Scott, simply participating honorably in these sports is more important than winning them. Both Steve and Scott mention that historically, people did not participate in tournaments with the sole intention of winning them. Existing records that describe Medieval and Renaissance tournaments frequently don't even mention who won. They do mention those competitors who did something remarkable. Winning the tournament wasn't as important as winning renown. Similarly, "Lysts on the Lake", with its Award of Honour, emphasizes the idea that winning the physical parts of the competition isn't as important as demonstrating chivalry -- or in modern terms, good sportsmanship -- while competing. Because of the Award of Honour and all that it implies, chivalry is apparently still an important part of the sport of jousting. At least during "Lysts on the Lake".